SAN FRANCISCO, Calif. — Museum of Robots (www.MuseumofRobots.com) in Second Life announces the “Build-a-Robot” Competition, and invites all Second Life residents to participate. According to the organizers, “Our goal is to explore what a robot is, how it can be expressed within the parameters of Second Life, and to encourage creativity and originality. Our definition of ‘robot’ is unlimited: any creation that the designer thinks can be called a robot is acceptable.” Entrants receive a merchandise prize, with an additional Linden dollars cash prize pool awarded to the top 10 winners. Entries must be received by June 25, 2008. Winners will be selected by panels of judges and popular choice, and announced at an awards ceremony at Museum of Robots on July 19. Entry Classes include Standalone display, Wearable, and Homage to Classic Robots. There is a maximum limit of 100 prims per entry. A “prim,” or primitive, is the basic building unit in Second Life, and a goal of the competition is to encourage efficient Second Life building techniques. Competition rules are available at Museum of Robots and sponsoring locations in Second Life and on the Museum’s web site. The Museum of Robots is located at [SLurl = http://slurl.com/secondlife/Kubrick/98/161/26%5D. 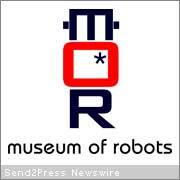 Museum of Robots is dedicated to the appreciation of robots. Its mission is to promote understanding of the place of robots in popular culture, art, and science and features exhibits, art, and special events. Current exhibits include: “The Art of Eric Joyner” featuring selected works from his upcoming book, “Robots and Donuts”; Celebrity Robots Hall of Fame, featuring famous robots of cinema and television; Toy Robots, featuring toy robots from a private collection, and Bot Shots, featuring robot photography.